That’s now nearly finished, so once the residents can move in the second phase becomes possible, if the finance has been secured. Across the street will be a ten storey building that will replace the existing Covenant House structure. The redevelopment will occur in phases with construction and fundraising over the next few years with an anticipated completion of the larger building in 2020. The buildings are designed by NSDA Architects, and both look a little like some of their other recent non-market buildings for BC Housing. The renders are from the Development Permit designs, which were relatively unchanged from the rezoning. This West End Plan initiated rezoning has been anticipated for a while. The White Spot on West Geaorgia was sold for redevelopment a few years ago; now the rezoning has been submitted for twin 38 storey condo towers. There would be 455 strata residential units, 200 in each of the towers and 55 located in the four storey podium. IBI Group are shown as the local architects, but the design is by US architects Pelli, Clark, Pelli. Henson Developments are apparently a new company (in Vancouver at least) so their first projects is ambitious, so say the least. It’s A West End tower on a mid-block site next to the Bing Thom designed Butterfly, now under construction. The long-established office of IBI Group are the local architects of a 60-storey tower proposal. The energy designer associated with the building says that it’s “being designed by Tom Wright of London-based WKK Architects. The project is presently the world’s tallest planned Passive House tower”. The building has to have a component of non-market housing, as it’s replacing existing rental. There are 114 units of non-market proposed in the base of the building, along with 49 market rental apartments and 323 condos. It’s a small site, so the hole for parking will be 8 floors deep. Like the Butterfly there will be visible planting on internal floors – in this case a grid of three storey high decks to allow the addition of trees. The building is targeting Passive House energy performance, while maintaining a glazed appearance, with 50% glazing in sealed modular triple-glazed units, and 50% super-insulated stainless steel panels. There’s been an apparently vacant warehouse (once used by Wosk’s furniture store) opposite the International Village mall for many years. It was finally offered for sale, and purchased last year. Here’s the development proposal for the building, which was constructed in 1950, and was initially a clothing factory operated by the Original Blouse Co. The existing four storey building would see retail use on the main floor, and three floors of office in the other three floors. 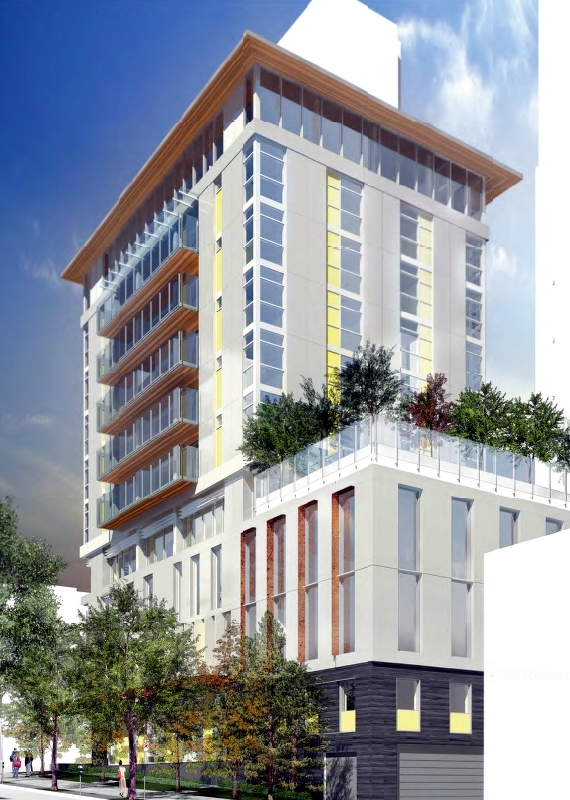 Two new floors would be added, which would have 16 secured market rental residential units. Metric Architecture have designed the project which has just two parking stalls, accessed from the lane. There’s already a summer Development Permit Board date identified, so it could move forward relatively quickly. There’s an existing brown steel building under here. Built in 1947, and altered in the 1960s, it was part of a cheque sorting and processing centre for many years. Westbank hired Henriquez Partners to design a medium term renovation including adding a new ‘Living Screen’ to the perimeter of the building, renovating the existing Main Street entrance lobby, facade renovations and new planting. The illustration shows larger office buildings nearby, already starting construction and associated with the long term aspirations of Hootsuite, the tech company operating in other buildings on this block. It looks like the screen was originally slightly differently configured. Whether the fairly recently commissioned mural will be revisited is also unclear. This industrial/office building was first proposed for the Mount Pleasant area in fall 2016. Now completed, it’s a cousin of an existing design. MGBA designed two matching buildings previously developed on 7th Avenue, and have refined those designs in this project for a three storey building (with a high industrial floor and mezzanine) on the corner of West 4th and Quebec. There have been some changes from the initial render. Some Mount Pleasant Industrial Area projects are quite large, but a few squeeze a new building onto a single 25 foot wide lot. Here’s a new project that’s only 9,008 square feet of space in total, on four floors. Designed by Hemsworth Architecture, a new practice currently located in an older building at this location, it’s intended to achieve Passive House energy performance for an industrial and office building.